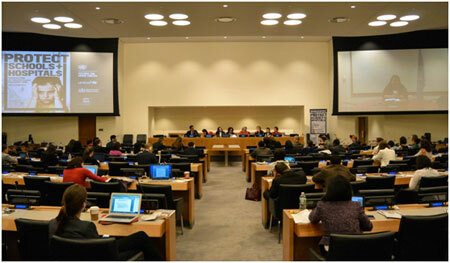 UNITED NATIONS, May 22 2014 (IPS) - With increasing reports on targeted attacks on schools and hospitals in armed conflict areas, a guidance note aiming to help prevent and end these violations was launched on Wednesday. The launch presented by the U.N. Special Representative of the Secretary-General for Children and Armed Conflict Leila Zerrougui said the note was designed to provide the necessary tools for those dedicated to ending and preventing unacceptable attacks on schools and healthcare institutions. “Every child everywhere has the right to education and health, but in conflict areas in the world these rights have been compromised,” Zerrougui said. The note entitled “Guidance Note on Attacks Against Schools and Hospitals” was complied by the office of the U.N. Special Representative of the Secretary-General for Children and Armed Conflict, U.N. Educational, Scientific and Cultural Organisation (UNESCO), the World Health Organisation, U.N. Children’s Fund (UNICEF) and U.N. experts on the issue. Zerrougui said that attacks on schools and hospitals have become an all too familiar aspect of conflicts today and that the guidance note would be a instrument to stop the attacks. The note provides practical implementation of the U.N Security Council Resolution 1998 that highlighted the violation of attacks on the two institutions. It also aims to help monitor and report attacks, promote advocacy and dialogue, and to increase partnerships with stakeholders. “A key component in our fight against attacks on schools and hospitals live with the security council’s monitoring process. With the security council resolution 1998 we received clear endorsement to dabble our efforts to monitor, respond and hopefully prevent attacks,” she said. UNESCO director general Irina Bokova said that between 1998 and 2008 an estimated two million children were killed in armed conflict and six million were left disabled. “Over half of the children out of school today live in conflict countries and this represents 28 million girls and boys. This we believe is a human rights crisis, a security crisis and a long term development disaster,” Bokova said. The Permanent Representative of Luxembourg Sylvie Lucas said the note launch was timely and cited the recent abduction of 300 schoolgirls and the hundreds of murdered school children in Nigeria. “The Security Council has expressed a unanimous deep concern at the military use of schools as it could render schools to attacks and endanger children and teacher safety,” Ambassador Lucas said. With the U.N Convention on the Rights of the Child in mind, Zerrougui called upon member states to make a greater effort to assist the U.N., conflict affected states and civil society partners to work towards a world where all children can attend school and seek medical attention without fear. “The fear is real. Preventable diseases such as polio are popping up due to the breakdown of health services in conflict areas as there are targeted attacks against vaccination workers. This is a tragedy,” she said.